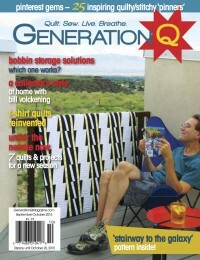 Quilters often ask, “what machine do you quilt on?” as a way of getting to know the new quilter sitting next to them. The answers are always fascinating because a lot of people do great work on machines that are not high-end or expensive. That’s the truth lived by Cindy Grisdela, author of Artful Improv. 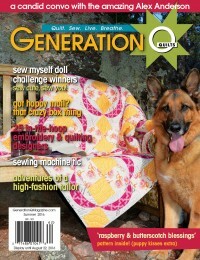 At the end of the book, there is a photo of Cindy with her machine, a BERNINA 1080. It’s about 20+ years old, has a couple of bells and whistles (such as the needle down feature). The fancier, newer, higher-end machines have a lot more juice, including knee-lift and a lot more stitches, too. A machine similar to the one used by author Cindy Grisdela. So, while the new mid- to high-end machines are off-the-hook-amazing with space and capabilities, great work is also possible on almost any sewing machine. encourages practice. It’s practice that makes a huge difference, says Cindy. GenQ: What’s your favorite ice cream? Cindy: My favorite ice cream is pistachio. 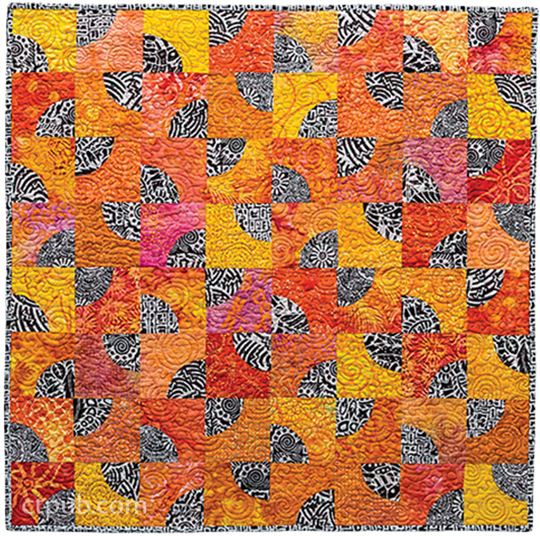 Butterfly Kisses by Cindy Grisdela, which was made without a specific pattern. 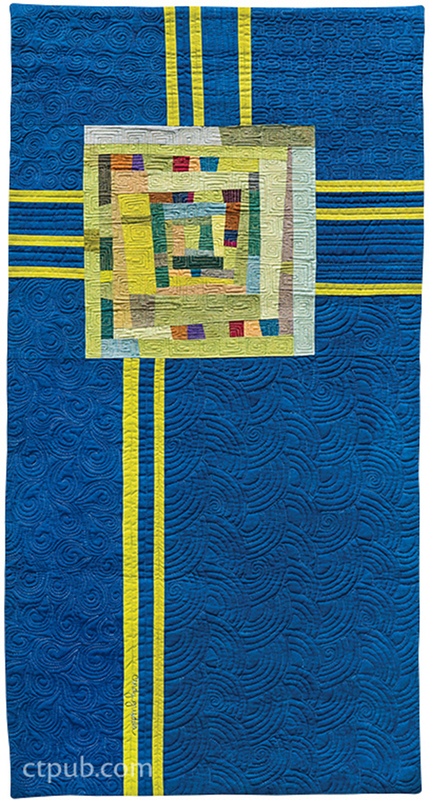 One of the quilts featured in her new book was made without a specific pattern–a classic improv technique. For those who’ve been pattern-bound, that can feel a bit risky. But make the jump! Go ahead and do it…and you might end up with your own Butterfly Kisses. I enjoy drinking Bass Ale. 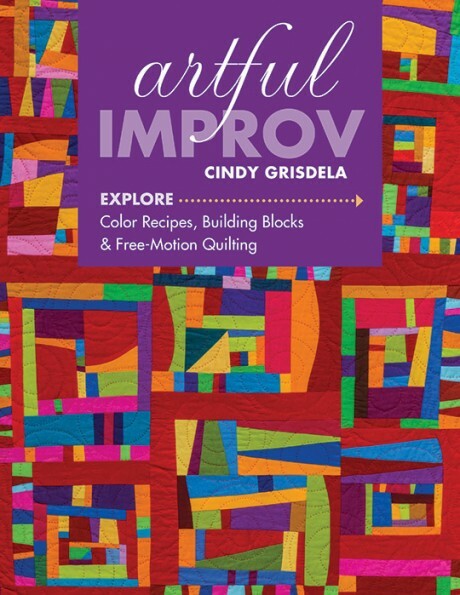 While there is an improv look and feel to each one of Cindy’s quilts, good technique is still a necessary solid foundation. Rotary cutters and rulers are used in each quilt so that blocks are square and lines straight. Except where they curve. Then they’re curvy. With Butterfly Kisses, she made each block without pins, then squared them up so the points would meet. Blue Totem by Cindy Grisdela. And now for an opportunity to win a copy of the book. 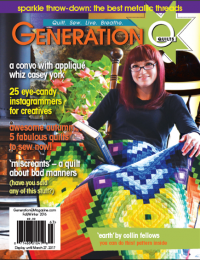 Tell us about a quilty thing you’ve experimented with, a technique, a fabric, a tool…whatever. On or about Wednesday, Oct. 26, using the Random Number Generator, a winner will be chosen for either a softcover copy of the book (U.S.-based folk) or digital copy (outside-the-U.S. folk). UPDATE: Congratulations to Comment #37 – Meredith. You won a copy of Cindy’s book. We’ll contact you by email and get this party started. Improv piecing is my jam. I have sewn with patterns for many years but in the last 5 years, have been making more quilts without a pattern to guide me. I like to play with the fabric and see where it leads me. I love my design wall because I can put my projects up there to stare at them and think about what to do next. I’m all about improv–even wrote a book about it. THIS book looks like a real winner. And there are no mistakes–only alternate design decisions! I absolutely love improv piecing! I am a beginner quilter and am experiencing how to mix my colors and fabrics now. I love that we have the same machine! Mine is my partner in crime. I’d love to win this book. Thanks! I was doing hand stitching and embroidery on a t-shirt quilted piece and tried out different threads to see how they would look. Going thru the interfaced t-shirt, batting, and backing well, that would cause the thread to breakdown quickly. I found that 3 strands of DMC floss gave me the look I was after. The metallic and rayon flosses didn’t hold up. I have totally embraced rotary cutting WITHOUT a ruler and love it. Oh, I still use the ruler for the final square up in most cases – but the freedom to cut and not worry has been addicting. Can’t wait to get my hands on a copy of this book (if the random number generator doesn’t pick me I’ll be buying it). Already I’m using the photos I’ve seen as inspiration. I have used men’s dress shirts, sometimes stenciled, in making quilted items. I’ve recently experimented with English paper piecing and foundation piecing. It sure where I’m going with either technique. Love Cindy’s quilts. 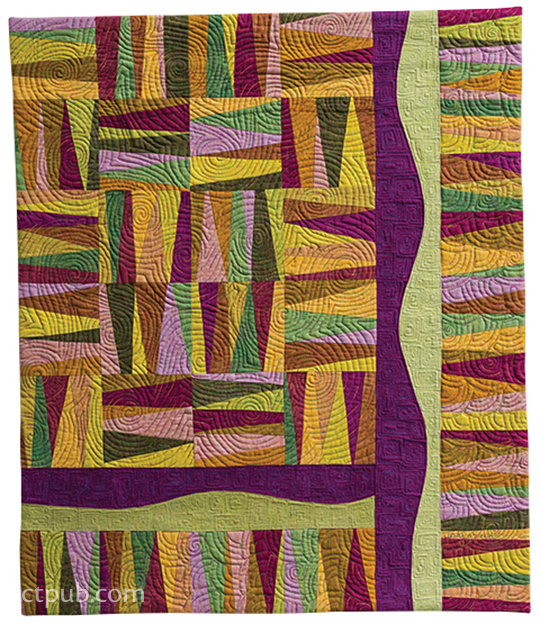 Many of today’s Art and/or Modern art quilters use an overall straight line technique for their final quilting. I have tried this repeat of the continuous straight line and found that I generally do not like the end result. 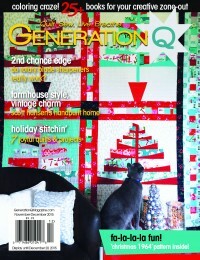 I really appreciate Cindy’s creative quilting techniques and I would love to know how she goes about choosing them when it comes time to finally quilt a quilt. I love Cindy’s work! Blue Totem is fabulous! Currently I’m trying thermofax printing, trying not to stick to colours I love!! I actually experimented with some improv this past weekend. It is so out of my box but I had a lot of fun. Sateen for low immersion dying. So vibrant! When making quilts I’ve experimented with some of the decorative stitches on my sewing machine to find out if the results are worth the extra time and thread they take up. Sometimes it works wonderfully and sometimes it’s clearly not worth the extra effort. 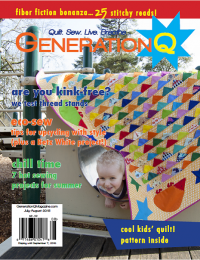 Probably the biggest quilting experiment I’ve made is free motion quilting. Every design is something new for me, and it continues to be the biggest challenge. I know they say “muscle memory” will kick in and it will all flow, but I’m not there yet — unless I’m doing straight lines. Thank you for the giveaway opportunity. Love to play with the sew kind of wonderful quick curve ruler, making blocks but not following a specific pattern. I also did this with a drunkards path block ruler someone gave me on loan. I’ve experimented with improv some, and I’ve done other pattern-free quilting, which is easy and hard all at the same time. I love it. It’s exhilarating. I think I could learn a lot from Cindy’s book! Thanks for the chance to win a copy! I love experimenting with the QCR from Sew Kind of Wonderful. I am using color recipes that if colors could smell, mine would be ready to smell and taste. I call my piece SMELL AND TASTE. I am trying my hand at trapunto. I love the look. Wish me luck. I just learned the serpentine stitch on my Janome. Playing with width and length. Love this stitch. Various Color threads. Not very adventurous. ha. Improv isn’t my comfort zone but I do love to play with combining different sorts of fabrics that others might not put together. On the last project I finished, I wanted to have skinny green curvy stems for flowers. Fabric didn’t seems to work, so I cut long lengths of green yarn and zig zagged over them and got the perfect look I wanted! I was happy that I took the time to think out of the box. I’m quilting with shot cottons for the first time. I love them, but I’m still trying to get the hang of them. I am learning to use rulers with my Midarm so every quilt is an experiment. Practice, practice, practice. I really have to work more with improv piecing, the technique looks so fulfilling! Thank you! Great interview, and a fun article to read! I love experimenting! I like to tweak methods and materials, changing things up! I wanted to experiment with different materials and textures on a special quilt for a dear aunt… I combined her favorite soft colors and Romantic-style of cotton prints, with lots of pieces of vintage (with a little new) cotton chenille, for a top that turned out as I had hoped! Backing it with ultra soft/plush microfleece (like Minky), I ended up with a quilt that was perfect for her!… SO soft, elegant, and full of wonderful textures! Right now, I’m experimenting with color and piecing, trying for a modern quilt in the traditional Korean pojagi style. Cindy’s book looks wonderful!! 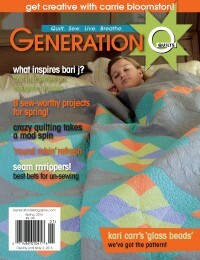 I need to get my hands on it… Her wonderful quilts are calling to me!! I am experimenting with a whole variety of free motion quilting techniques. More and more I am drawn to improvisational! Earlier this year I tried the New York Beauty block–paper piecing plus curved piecing– for an important project. It turned out really well! I want to become more proficient with improv design. I look forward to the book. I refer to my sewing space as the Sewing Lab. I like to experiment a lot. My favorite tool is my computer and Photoshop for design, color exploration, printing pattern on cloth, printing my pen work….What a great time we live in! I love using the improvisational technique especially cutting , sewing back the pieces in a different and fun way! 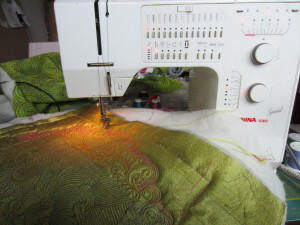 I also have that Bernina machine and I love it as it is a work horse! Hmm, the biggest quilty thing I’m experimenting with right now is color…neutrals, brights, and everything in between! Some unfortunate blocks have resulted, but more often I am startled to discover a new combo that I like! Thank you for the chance to win! I tried improve on the front of a fabric baby book and loved it- really want to use it more! Love trying new techniques, and would love to learn more about improv. I have been experimenting with FMQ a bit recently – a lot of fun! I have begun learning hand stitching for added interest. Not sure if I love it (doing it) or just the way it looks when added. I have been trying improv quilting by cutting blocks apart, adding fabric then resewing them. I am surprised at how good it looks when you don’t worry about being perfect. My quilts are never perfect and this fits in with my style. I’ve done a little improv, but would like to explore more! Love Cindy’s work! I’ve been experimenting with paper piecing tools like the 1/4 ruler (love it) I also tried a seam roller (really a wall paper seam roller) really didn’t get the results that I expected, but I’m going to keep trying.